A newly formed consumer packaged-goods snacking company exhibits several attractive characteristics. In this series, I offer quick takes on investment candidates that are worthy of jotting down on a sticky note and leaving on the corner of your desk -- or refrigerator, where I tend to stick mine! Such stocks may not represent conviction buys just yet, but I believe they deserve a spot on your watch list for potential accumulation. Prospective stocks are typically younger and/or smaller-capitalization companies, but they also include value plays and dethroned market leaders that may deserve a second look. In early July 2017, Conyers Park Acquisition Corp. and NCP-ATK Holdings, Inc. completed a business combination to form a new holding company, which began trading as The Simply Good Foods Company (NASDAQ:SMPL) on July 10, 2017. The consumer packaged goods (CPG) corporation falls under the small-cap stock category and sports a current market capitalization of $1.2 billion. The merger that created Simply Good Foods pairs a Canadian wellness brand, SimplyProtein, with the weight-loss organization Atkins, famous for the Atkins diet. The new entity describes its offering as a "highly focused product portfolio [consisting] primarily of nutrition bars, ready-to-drink shakes, snacks, confectionery products, and frozen meals marketed under the Atkins, SimplyProtein, Atkins Endulge, and Atkins Harvest Trail brand names." According to CEO Joseph Scalzo, the Atkins label has transitioned from a weight loss-focused brand to one that emphasizes low-carb, low-sugar, and protein-rich snacks. This repositioning has extended Atkins' addressable market from 8 million programmatic weight-loss enthusiasts to 31 million largely self-directed potential customers, whom Scalzo describes as "low-carb-seeking lifestyle consumers." The Atkins brand has followed the lead of competitor Weight Watchers International, which has seen its financial and stock returns jump over the past two years after enlisting Oprah Winfrey as a celebrity spokesperson. Atkins hired actor Rob Lowe as a brand spokesperson in January of this year, and management already sees a benefit in the form of higher sales. Lowe is also helping spread awareness of Atkins' newer identity as a lifestyle brand versus its former identity as a suite of diet products. SimplyProtein, the company's second major brand, markets protein-rich, low-sugar snack bars that are primarily distributed in Canada. SimplyProtein has developed a reputation in Canada as a wellness label, and it's targeting the U.S. for volume growth in the coming years. Perhaps Simply Good Foods' most attractive characteristic is its growth potential. The two core brands have combined for nearly double-digit revenue growth post-merger, which is unusual in the current packaged-foods environment. Many larger peers have struggled to hit even low-single-digit revenue improvement in the past few years. In the company's third quarter of fiscal 2018, year-over-year revenue advanced 11%. That's heady performance in the packaged-foods arena, and this type of sales acceleration, if continued, is likely to elevate Simply Good Foods as an attractive takeover target in the future. Let's take a brief walk through some key metrics and ratios covering the first three quarters of Simply Good Foods' 2018 fiscal year. Year-over-year comparisons are shown on a pro forma basis, as if the Conyers Park and Atkins organizations were already combined in 2017. Data source: Simply Good Foods. YOY = Year over year. TTM = last trailing 12 months. 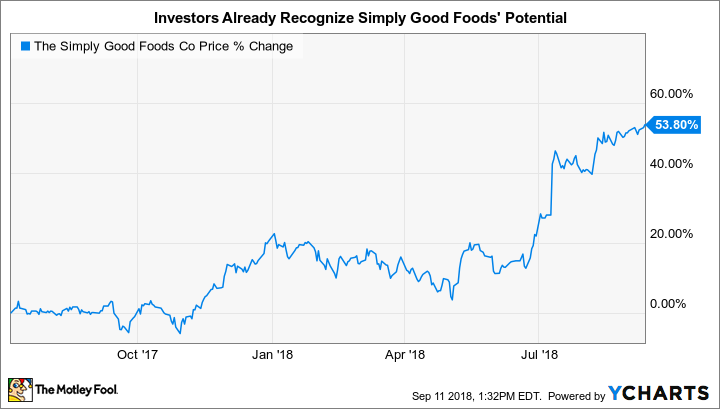 Simply Good Foods exhibits an attractive operating margin of over 15%, and as you'll note, net profitability has exceeded operating margin over the past three quarters, the result of a tax benefit the company received from the recently enacted U.S. corporate tax legislation. Data source: Simply Good Foods. Net debt-to-EBITDA is calculated using author's estimate of fiscal 2018 annualized EBITDA. Times interest earned is calculated for the first three quarters of fiscal 2018. The corporation exhibits healthy liquidity. Current assets outrun current liabilities by nearly 6 times, as the current ratio indicates. Management intends to grow the entity's top line partly through acquisitions, so some of this excess cash may be put to use in the coming quarters. As for leverage, Simply Good Foods has only $103.4 million of net debt on its balance sheet, and it displays reasonable leverage, as net debt is just 2.5 times annualized EBITDA. Simply Good Foods' times-interest-earned metric of 3.5 means its earnings before interest and taxes, or EBIT, is enough to cover interest expense on its debt more than three times over. In sum, the company harbors no worries over its solvency. Data source: Simply Good Foods. Given revenue of more than $323 million in the first nine months of 2018, Simply Good Foods is converting roughly 10% of its top line into free cash flow -- a healthy amount of cash generation. The snack provider's forward price-to-earnings (P/E) ratio of 27.3 is significantly higher than that of its larger peers, as measured by the S&P 500 index consumer staples sector's forward PE of 17.3. However, this thumbnail valuation is in line with the general universe of small-capitalization companies, as the average forward P/E of the Russell 2000 index stands at 27. As The Simply Good Foods Company successfully exploits a niche within the snacking industry, it's vulnerable to well-resourced peers that may evolve competing products as they eye its brisk growth rate. The company may draw more competitive attention as it seeks greater presence for the SimplyProtein snack line on U.S. store shelves. Image source: Simply Good Foods Company. Another specific risk to consider is the company's concentration in a single customer. Ubiquitous grocery retailer Walmart accounted for 42% of Simply Good Foods' fiscal 2017 revenue. Such a figure isn't so peculiar in the CPG world; WalMart is also the largest customer of snacking and beverage giant PepsiCo, snacking and soup behemoth Campbell Soup, and condiment titan McCormick & Company, accounting for 13%, 20%, and 11% of those companies' 2017 sales. Still, as a relatively smaller organization, Simply Good Foods depends more on Walmart than its multinational counterparts do. Scrawl the SMPL ticker on a sticky, but give The Simply Good Foods company a few more quarters of operating history before committing to a significant position. Those troubled by a fear of missing out can consider gradually averaging into these shares.